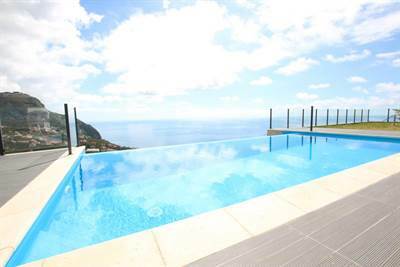 • 314 sqm , 3 bath , 3 bdrm 2 storey – FOR SALE EUR825,000 . Contemporary luxury Villa construction completed 2018. Stunning views of both Cliffs and Ocean. Excellent location. Within a short drive from the beach and within walking distance to Sports centre. Built to high standards and quality finishing. On a prime double plot. Offering king-sized family accommodation and entertainment areas with barbecue and infinity pool. Large open plan fitted kitchen with water feature.